It’s Newsy is in the process of moving to its permanent site! Check out the new site soon for more reviews and recent designs. Psych-o [sahy-koh] noun: a person, of sane or unstable qualities, who follows the TV show on USA Network, and also happens to be in love with James Roday and Dule Hill. I flew to New York in a whirlwind. Well, I actually booked my ticket a week in advance after discovering a little treasure in my email. But my point is, it was a surprise. 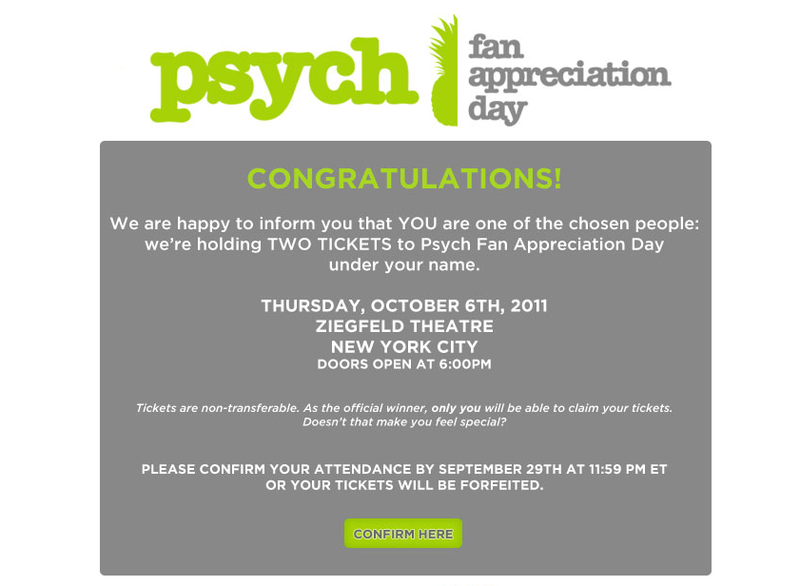 So, I won tickets to Psych’s Fan Day season 6 premiere. Debated for a day if I should go. Then decided it’d be seriously silly not to. Commence Psych-o weekend. More than 500 fans and ticket winners lined up starting at 3 p.m. at the Ziegfeld Theater in Manhattan. I arrived with my friend Sarah Tomoser at 3:30 p.m. and the line was already CRAZY. Down the block and turning the corner kind-of-crazy. (But for the poor souls who showed up later … the line doubled back several times. Unfortunate for them. As we waited for hours, we thought of deep and meaningful questions (aka funny and something that would get us onstage) to submit to the cast’s Q&A. I was hoping for a ton of free goodies and I was not disappointed. Psych swag included: pineapple foam finger. Polaroid pictures. t-shirt. popcorn. drinks. bottles covered with Shawn and Gus’s faces. They showed the episode. Then came the hilarious Q&A which you can find on their website. (The audience Q&A I believe is separate from the one shown on TV.) My friend Sarah actually had her question asked! (What episode was the most extensive to creative, either money or time wise?) Steve Franks, the creator, loved it. Apparently season 6’s final episodes were some of the most expensive and time-consuming to produce. She got a free hoodie. = I’m jealous and my inner journalist is frustrated that I didn’t think of a super brilliant question. (My question was: Psych is notorious for nicknames. Does the cast have any off the set?). By the way, did you know they have Psych toasters? Yes, you can have a pineapple on your toast. And the cast just happened to throw autographed pieces of toast into the audience. Crazy? Yes. What’s more crazy? People were falling all over each other for that toast. My conclusions: I want to be Dule Hill’s girl. James Roday is suave and mysterious (fun fact: real last name is Rodriguez). And I want Maggie’s haircut. The first episode of season 6 is GLORIOUS. It is the most action-packed, tense, and suspenseful episode they have yet to release. So I hope y’all are ready tomorrow night. (Will Shawn give away that he’s not psychic? Will he get caught sneaking into an ambassador’s house? Will Juliet leave Shawn? Will Lassie kill him?) Tune in at 11 p.m. MTN time to watch it. I’m practicing shooting video with my iPhone4 for my backpack journalism class. Needless to say, I need bucketloads of practice. Here’s a video of Union Square off of 14th Street in New York City. I love sitting in the square, watching all kinds of crazies walking by. It doesn’t hurt that they have tons of delicious food surrounding it and the farmer’s market offering organic produce, food and flowers. Cupcakes now have a competitor in the ring. Enter: waffles. Having dominated the dessert market in the U.S. for the past several years, cupcakes have met an unlikely and recent contender for the title. Waffle shops are popping up across the country, including Utah. Places like Bruges Waffles in Salt Lake City are famous for their waffles and frites (and have been spotlighted on several food and travel shows). This new food fad hasn’t neglected Provo, UT either. The Awful Waffle shop is a restaurant set up just south of BYU’s campus offering waffles and crepes. What makes waffles so special? They’re new and different and a much better meal than a cupcake. So, find your own local shop. In an effort to cherish the finals days of summer, I visited Page, AZ a couple of weeks ago, which is the home to Lake Powell, the Navajo Reservation and Antelope Canyon. It was a weekend of relaxation, bliss and cultural enlightenment (I went to a Navajo wedding). It was only a five to six hour drive from Provo, UT, which is an ideal weekend getaway. The warm sun was a welcome friend and the culture is friendly. Little fact: Antelope Canyon has hosted a large amount of professional photographers, celebrities, and models. I recommend it to anyone who is tired of Las Vegas, St. George, and the other typical local weekend escapes from life.